Georgia has definitely never been a state I had been dying to visit. I had passed through the Atlanta airport, my sole experience with the peachy state, and remember it being stuffy and huge (lots of walking). Plus I had never really heard of a compelling reason to go for recreational purposes. But recently, I had to go to Atlanta for work and hence began scouting out what the area would be like. And the more I scouted, the more I wanted to get there quicker. The city not only has some beautiful neighborhoods (like Decatur and the Georgia Tech area) but some fairly interesting attractions (an aquarium with whale sharks). But the coffee is what won my heart over. 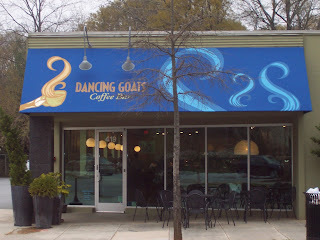 One place in particular that I had the luxury of hitting twice was Dancing Goats Coffee Bar in lovely Decatur. The establishment has a large blue awning under which sit ample chairs and tables to best aid in enjoying lovely Atlanta sunny days. The interior was even grander, with a huge open floor plan (some would argue too open) with a very eclectic variety of seating, the whole space bathed in calm colors such as tans and light greens. The coffee is their own, though called Batdorf and Bronson (rolls right off tongue), which is roasted locally in Atlanta. 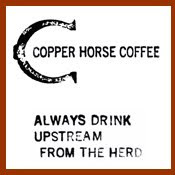 They serve coffee via drip as well as on a Clover. Both visits I had coffees off the Clover, to which I must say that the coffees didn't really fully utilize the machine (or visa versa) but nonetheless, both brews still sampled tremendously well. The Kenya AA was described to me as having a dried fruit and Cabernet taste to it, but I only really got a hint of the fruit. The Java Estate also sampled smoothly but I couldn't really pick out too many distinct flavors, just that it was good. 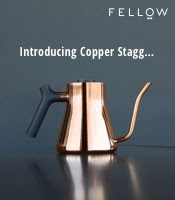 The espresso was pulled very well and tasted spectacular. The doubleshot was really sweet with cocoa flavor and what seemed to be a nice floral bloom as it hit my tongue. The tea was Harney and Sons. I must have idly said "boy do I wish there was a shop like this closer to home" at least four times during my visit to Dancing Goats. The place is definitely popular with the locals and is only a short distance from the Decatur MARTA stop, so there's little reason not to prance yourself over when you're in town.